In order to access content, please enter password. Rehearsals begin August 29 (no rehearsal Labor Day Sept. 5, and there will be rehearsal Columbus Day Oct. 10). Rehearsals begin August 31 (there will be rehearsal Oct. 5, the day before Fall Break). Dr. Askim will provide details as available. Rehearsal and performance of significant repertoire for symphony orchestra from the 18th-21st centuries, including individual practice techniques, rehearsal protocols, discussion of historical and musical significance of repertoire, and public performances. May be repeated for credit. Possible charge for concert dress. Students may be asked to provide individual transportation to an off-campus local performance. Restrictive statements: Audition required. May be repeated up to 8 semesters. Learning outcomes: Students will demonstrate (1) proficiency in music ensemble performance as applied to specific repertoire and genres and (2) knowledge of rehearsal and performance conventions for the ensemble. Through regular full ensemble rehearsals, sectional rehearsals, and public performances, students will gain theoretical and practical knowledge of significant ideas in music through the study and performance of ensemble repertoire. Focused performance at your highest level in all scheduled rehearsals and performances, contributing to the growth of the ensemble. Individual practice on parts between rehearsals, progressing toward mastery at your highest level. Demonstration of musical and technical progress and achievement on individual parts in rehearsals, performances, and individual sessions. Demonstration of understanding of correct rehearsal techniques and protocols. Listening to repertoire in rehearsal or outside, when assigned. Textbook: No text is required; all music is supplied on loan by the department. Grading: Course grades are based on ongoing assessment of the above course expectations during rehearsals and possible individual performance sessions. 60% – Performance: ongoing assessment of the above performance expectations within rehearsals. 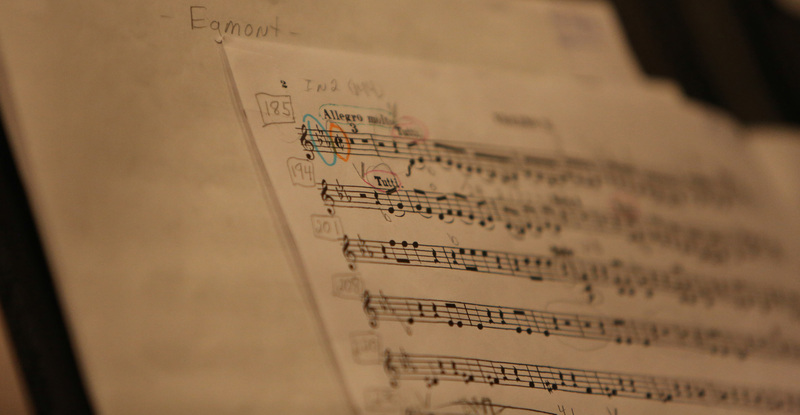 Ensemble conductors are constantly making assessments of players’ performance. Based on rehearsal and individual assessments, students will be informed of their standing on the performance aspect during the semester. 40% – Attendance: See below also. For each unexcused absence = 10 points off. Because the course is based on performance participation and meets only once a week, attendance is vital. You are expected to attend, ontime (early) every rehearsal and performance, staying for the entire rehearsal. If you need to be absent, you are expected to notify the conductor before the absence, no later than 6:30 pm. One unexcused absence is allowed. More unexcused absences will lower your grade. See below. You are allowed one unexcused absence, then each subsequent unexcused absence will result in 10 percentage points being deducted from your final grade. An unexcused absence from a performance will result in an F for the semester. Attendance will be taken by sign-in sheet, and it is the students’ responsibility to make sure that he/she checks the sheet at each rehearsal. Incompletes: As it is not possible to make up ensemble work, incomplete grades will not be given. Trips: Students may be asked to provide individual transportation to an off-campus local performance. Attendance Notification policy: If you are going to be absent or late for any reason, you must notify the conductor before 6 pm, either by phone or email, explaining the situation. Except in an emergency, failure to call ahead will result in an unexcused absence. If we need to see a written excuse for illness, you will be notified. Raleigh Civic Symphony: Email Dr. Peter Askim paaskim@ncsu.edu or call (919) 515-8279 to leave a message. Raleigh Civic Chamber Orchestra: Email Dr. Peter Askim paaskim@ncsu.edu or call (919) 515-8279 to leave a message. Messages will be checked at 6:00. If you know of an upcoming absence, email rather than tell the conductor in person at rehearsal. Listening: You are required to listen to all of the pieces being rehearsed early in the semester. These will be available through the orchestra website: www.ncsu.edu/rcs under the “for players” section. The username and password will be distributed in rehearsal. Sheet music policy: Music folders and parts are signed out to each player at the beginning of the semester and are due back at the final concert or last class meeting. Lost music will be assessed a fine of $25. A+ grade option: (In addition to the above requirements for earning an A): Write a three-page research essay on the orchestra repertoire for this semester. Focus on biographical or historical details, and document your sources. All sources must be scholarly publications – take particular care with web sites! And of course, do not replicate the concert program notes. Deadline: last day of classes. Submissions may be by email attachment (Word document) or hardcopy. Lockers: Instrument lockers are available from the music office for students enrolled in an ensemble. End-of-semester: All school-owned instruments, uniforms, concert dress, and lockers must be turned in by the final day of classes. Failure to do so will result in a departmental $50 late charge per item and registration hold. Concert Dress: Required of all players. Women: Black dress or pants, black dress shoes. Men: Tux, dress shirt: either black (with or without black tie) or white shirt (with black tie), black dress shoes. Tuxes for male students are available from the music department office. You should get your tux early in the semester. There is a small charge, and all tuxes must be returned by the last day of classes. You are expected to attend, on-time (early), every rehearsal and performance, staying for the entire rehearsal. If you need to be absent, you are expected to notify the conductor before the absence, no later than 6 pm. Three absences will result in a conference with the conductor about continuing in the group. Because the orchestra meets only once a week, attendance at all rehearsals is expected. Your responsibility is to contribute to the growth of the ensemble as well as to the mastery of your individual part. If you are going to be absent or late for any reason, you should notify the conductor before 6 pm, either by phone or e-mail and leave a message explaining the situation. Raleigh Civic Symphony: Email Dr. Peter Askim> or call (919) 515-8279 to leave a message. Raleigh Civic Chamber Orchestra: Email Dr. Peter Askim> or call (919) 515-8279 to leave a message. Players should be in place at least 5 minutes early (7:10) for warm-up. Arrival after tuning has begun will be considered late. Sound files of the repertoire will be available on the orchestra website. Access will require a username and password, announced at rehearsal. All players are strongly encouraged to listen to the repertoire through the website or recordings. Required of all players. Women: Black dress or pants, black dress shoes, minimal jewelry. Men: Tux, dress shirt: either black (with or without black tie) or white shirt (with black tie), black dress shoes. Folders and parts are signed out to each player at the beginning of the semester and are due back at the concert. Late music will be assessed a fee of $5; lost music will be charged $25 per part. In case adverse weather, rehearsal cancellations may be necessary, sometimes at the last minute. Decisions will be made by 3:00 pm at the latest. Notification will be by email – please check your email if the weather looks bad. Also: If NC State has announced “Classes Cancelled” or “Adverse Weather Policy in effect” for Monday evening, then rehearsal is automatically cancelled. You can check the university web site: www.ncsu.edu for this notice. Your contributions of time, expertise, artistry and dedication to our collective experience as well as financial contributions are appreciated. While not mandatory, we ask that each community musician make a meaningful financial contribution to support the orchestra program and exciting programming.